Aero Manufacturing 2TGBX-2496 96&quot;W x 24&quot;D Stainless Steel Workbench 4&quot; Backsplash Galv. 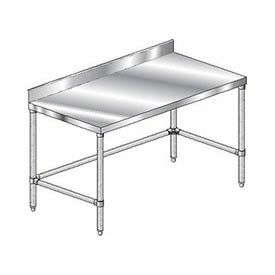 Aero Manufacturing 2TGBX-2496 96"W x 24"D Stainless Steel Workbench 4" Backsplash Galv. 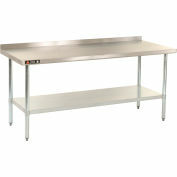 Aero Manufacturing 4TGBX-2484 84"W x 24"D Stainless Steel Workbench 4" Backsplash Galv. 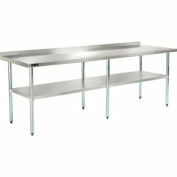 This Stainless Steel Workbench with 4" Backsplash, Galvanized Steel Legs and Crossbracing features a 14GA 304 Type Stainless Steel Top measuring 96"W x 24"D. Crossbracing is 1-1/4" O.D. 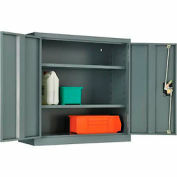 16 gauge galvanized steel. 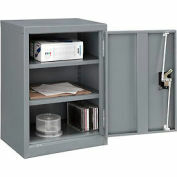 Tubular legs are 1-5/8" O.D 16 gauge galvanized steel, complete with 1" adjustable impact resistant, plastic feet. 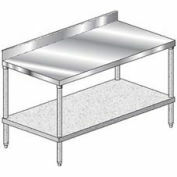 Stainless steel benches are sound deadened to resist vibration with 1-7/8" hemmed safety edges. Fully welded gussets for extra rigidity. NSF® Listed.